Seeking to put God's love into action. 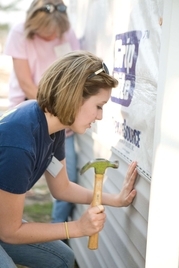 Escambia County Habitat for Humanity brings people together to build homes, communities, and hope. Community volunteers are always welcome, no matter what their construction experience or skill levels may be. For volunteers who do not wish to work in construction, there are a wide variety of Habitat functions they can perform. To volunteer, simply call the ECHFH office at 251-867-0095. We can use anyone at any skill level from beginner to expert. Especially needed - experienced electricians, plumbers or carpenters. Must be age 16 or older to work on the construction site (parent/guardian permission required for those under age 19). Those under age 16 can help paint, work at the registration table, or pass out refreshments. Volunteers are needed to prepare and serve lunches and snacks during construction. Our ReStore needs volunteers to help clean and tag items, stock shelves, pick-up deliveries, etc. Please contat the Habitat ReStore at 251-867-5659 if interested. We need community volunteers on many of the committees that help guide ECHFH. Contact the ECHFH office if you would like more information on volunteering to serve on a committee.